This drug was originally created to treat issues with the heart and blood vessels. Researchers have discovered that the most common form of acute leukemia which strikes adults, acute myeloid leukemia (AML), prevents chemotherapy from being delivered properly by causing bone marrow to leak blood. This means that, by using drugs developed to treat blood vessel and heart problems in concert with chemotherapy, AML might be much more treatable. In this study, these drugs reversed bone marrow leaks in tissue from mice and humans, and also boosted chemotherapy effects. Since these drugs are already in clinical trials for other applications, the team hopes that they may be approved for use in the treatment of AML patients soon. “We found that the cancer was damaging the walls of blood vessels responsible for delivering oxygen, nutrients, and chemotherapy. When we used drugs to stop the leaks in mice, we were able to kill the cancer using conventional chemotherapy,” Diana Passaro, Francis Crick Institute researcher and first author of the paper, said in a press release. The team studied the ways in which AML affects bone marrow by injecting healthy mice with bone marrow from AML patients to create AML mice. They then used intravital microscopy to compare the bone marrow of AML mice with healthy mice and observed pre-loaded fluorescent dyes leaking from the bone marrow blood vessels into the AML mice. 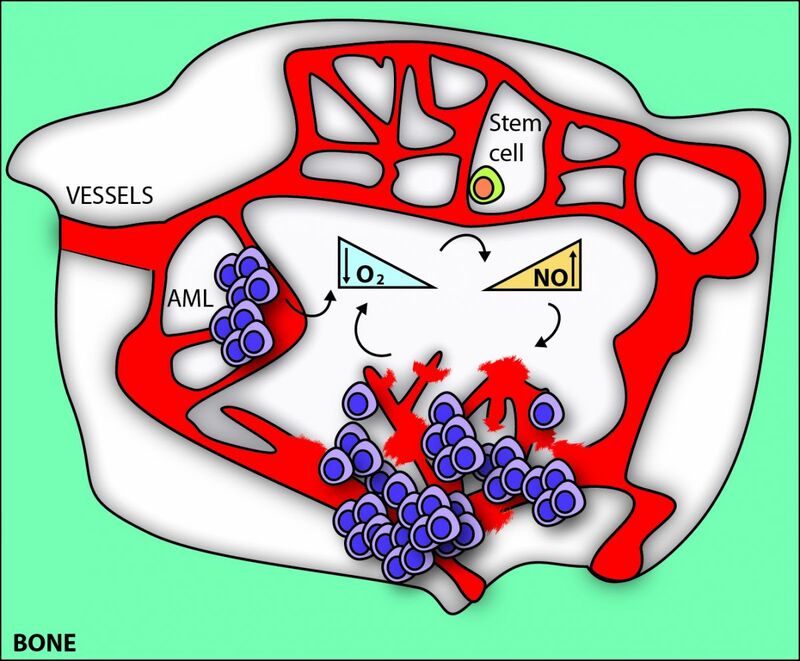 Next, they discovered that the cells lining the blood vessels in AML mice were oxygen-starved, which led to increases in nitric oxide (NO), a muscle relaxant. They realized this was probably causing the leaking, and provided NO blockers to the AML mice which slowed leukemia progress and extended remission. The team not only helped chemotherapy drugs to reach their targets more effectively, but they also found that NO blockers increased stem cells in the bone marrow. This might help healthy cells out-compete cancerous cells, and improve treatment outcomes. Finally, the researchers found that an inability to reduce NO levels and chemotherapy failure were related. With an average lifetime risk of less than half of one percent among the general population, AML is relatively rare. This is in addition to the fact that AML is a disease that primarily affects older people; the average age of AML patients in the US is 67, and the disease is even rarer before the age of 45. Despite this rarity, however, The American Cancer Society estimates that there will be around 21,380 new cases of AML in the US in 2017, and about 10,590 deaths, almost all in adults. This high death rate is linked to the character of this form of cancer, which is particularly aggressive. This is in large part due to chemotherapy resistance and relapse, fewer than 25 percent of patients survive longer than five years after diagnosis. However, if this research leads to a new regimen of combined drug therapy, these numbers may change.